The two volumes of collected articles Education and Sustainable Development: First Steps Toward Changes published in 2006 and 2007 by the Institute of Sustainable Education and Baltic and Black Sea Circle Consortium in Educational Research attempt to reflect the understanding of this complex issue in the mindscape of educational scientists and the results of their research in the context of sustainability. Authors have tried to find the links between their own area of study and the overarching theme of sustainability. The two collections reflect the interdisciplinary view of researchers from various countries on the theory and practice of education and sustainable development, inspiring the complementary approach and modelling the frames of reference for implementation of the holistic conception of sustainability in education. Students, researchers, university teachers, educational policy makers and all who would like to contribute to the UNESCO decade for ESD might draw useful ideas and inspiration from this book. The decade from 2005 to 2014 has been declared as the United Nations Decade of Education for Sustainable Development challenging the researchers and practitioners to contribute to this important field. We are glad to present the 1st annual collection of articles issued by Institute of Sustainable Education that was established at the Faculty of Education and Management (Daugavpils University, Latvia) in 2004. The collection is an international peer-reviewed edition and also the first publication of the BBCC (Baltic and Black Sea Circle Consortium), founded in Vechta University (Germany) in May, 2005 during the 3rd International JTET Conference "Sustainable Development. Culture. Education". The consortium is targeting toward the educational research and international dissemination and implementation of the results in line with the tasks of education for sustainable development. The idea of the collection was conceived during the JTET Conferences and, therefore, the Consortium network members gained the possibility to disseminate the results of their educational research. This is the first year of Consortium's work and this collection shows the first steps we are taking toward our aim of sustainable development. The collection should not be evaluated as a full picture of interrelationships between the education and sustainable development. This is rather an attempt to put together the fragments of a mosaic constructing both the awareness and understanding of this complex issue in the mindscape of educational scientists in different countries and, at the same time, showing the results of their research in the context of sustainability. As one can notice in the collection, there are not so many articles, which analyse concepts of sustainability, ESD and Sustainable Education as such. Authors have rather chosen to integrate these concepts in their own research topics, trying to find the links, making the bridges and passages between their own area of study and the overarching theme of sustainability. The collection consists of two parts: the first part contains the articles of educational researchers from different countries oriented toward the education and sustainable development, while the second part of the collection represents the project of pilot research led by William Greene from Southern Oregon University "Teacher education for the future project: A collaborative study of diverse perspectives from Fiji, Korea, the United States, and Latvia". Researchers from USA, Fiji, South Korea, and Latvia investigated perceptions about the future directions for teacher education and compared these internationally. Articles of educational researchers come from eight countries: Estonia, Finland, Germany, Hungary, Latvia, Lithuania, Sweden, and USA. The collection of 24 articles starts with the subsection, which introduces the concepts of ‘sustainability', ‘education for sustainable development', and ‘sustainable education'. Researchers have made an attempt to analyse the perception of these concepts in the society, discerning the strengths and weaknesses of these perceptions. The collection proceeds with the articles picturing the bonds between the education and sustainable development in the context of teaching and learning and recognizing the challenge both for the form and content of these processes. Next subsection takes a glance at the possibilities of sustainable development in preschool education, thus supporting the idea of ESD at all levels of education. Very important aspect of education and sustainable development is connected with the teacher education and training, as it is the possibility for extensive dissemination of this idea among the different generations. 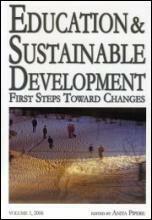 The last group of articles focus on social and economic context of sustainable development. Editorial Board was assembled specially for this collection and the work on this collection was a big challenge and adventure for the whole team in Latvia and abroad. Some members of this board had already been involved in active cooperation with Institute of Sustainable Education; however, many experts were invited to join the team for the first time. We are proud that our Editorial Board consists of highly professional experts from 14 countries all over the world: Australia, Canada, Estonia, Finland, Germany, Hong Kong, Jamaica, Latvia, Lithuania, Malaysia, Malta, The Netherlands, Thailand, and USA. Finally, I would like to express my gratitude to the authors of the articles who made our cooperation so fruitful and mutually enriching. Also, the gratitude from me and the authors is granted to all members of Editorial Board for their altruistic devotion to the idea of sustainability and invaluable help for the authors of the articles. Besides, the Editorial team of the collection would like to convey our gratitude for the Ministry of Education and Science of Latvia for providing the grant which has made it possible to publish this edition. The second volume of collected articles Education and Sustainable Development: First Steps Toward Changes published by the Institute of Sustainable Education and Baltic and Black Sea Circle Consortium in Educational Research reflects the interdisciplinary view of researchers from various countries on the theory and practice of education and sustainable development, inspiring the complementary approach and modelling the frames of reference for implementation of the holistic conception of sustainability in education. The students, researchers, university teachers, educational policy makers and all who would like to contribute to the UNESCO decade for ESD can find this book useful for them. In May 2006, for the first time the new publication of Institute of Sustainable Education at the Faculty of Education and Management of Daugavpils University and Baltic and Black Sea Circle Consortium in Educational Research appeared - it was the collection of scientific articles "Education and Sustainable Development: First Steps Toward Changes". The second volume of collection embraces the original research in the field of education. The collection represents a variety of theoretical and practical cross-disciplinary interests. It reflects the interdisciplinary view of researchers from different countries and disciplines on the theoretical and practical problems of education and sustainable development, inspiring the complementary approach and modelling the frames of reference for practical work toward the holistic integration of sustainability in education both locally and globally. It is an attempt to put together the fragments of a mosaic constructing both the awareness and understanding of this complex issue in the mindscape of educational scientists and, at the same time, the presentation of the study results in the context of sustainability. The collection is an international peer-reviewed edition with Editorial Board consisting of 21 members from 15 countries. Articles of educational researchers come from ten countries. The collection of 18 articles starts with the subsection, which reflects the attempts of authors to create the theory for sustainable education from the perspective of philosophy, education, and psychology. The collection proceeds with the description of experience with educational projects on sustainable development in different cultural and political contexts. Next subsection takes a glance at the possibilities of sustainable development in higher education thus supporting the idea of ESD at all levels of education. Further the collection focuses on issues of educational leadership, cross-cultural comparison and gender. These articles view these distinct educational questions in a framework of aims and strategies for sustainability. The next subsection explores the connection between the education and human life, analysing the perceptions and experience of education and trying to lead out of the unsustainability toward more sustainable quality of life. The collection concludes with the articles on educational action research for sustainable development carried out at the Institute of Sustainable Education at the Daugavpils University. The researchers have studied the process of becoming the researcher within a context of ESD at different educational levels: in secondary school, in bachelor, master, and doctoral studies. The work aims to present the original research on the diverse links between education and sustainable development conducted in different parts of the worlds, thus creating the possibility to find the similarities and distinctions in the views and to evaluate their causes. It can be the source of references for researchers in the field of education for sustainable development specifically, and in educational changes in general, to reverie on the epistemological, ontological and anthropological issues this collection is representing. The primary audience for this work is the researchers, university teachers, and educational policy makers involved in education and sustainable development. Also, secondary and tertiary students and all who would like to participate in the UNESCO decade for ESD can find this book useful for them.